I got an email this morning from my favorite and only cousin, mom of tiny F.
Fa la la la la, la la la la!" Last night was a late one. A special company dinner at an old-school steak house. Sometimes a girl needs a filet mignon, creamed spinach and a baked potato and I was fortunate enough to have just that. And, for the second time this month I walked from midtown to the station late at night. Fear not, it's not like I'm walking alone in the dark in the city at 11pm. I could barely make my way through the crowds in the artificial daylight light. We had our Ugly Christmas Sweater party. It expanded into Just Plain Ugly Christmas as we unpacked a hot pink Christmas tree we had in storage and people lined the room with Christmas suspenders and Santa hats with blinking lights and even, well, I can't explain this - have a look. Two of my friends have those musical snowmen from the Hallmark store on their desks and they created sweaters to match them! They won one of the prizes. It was amazing work and we had lots of fun. You know what's tough to do? 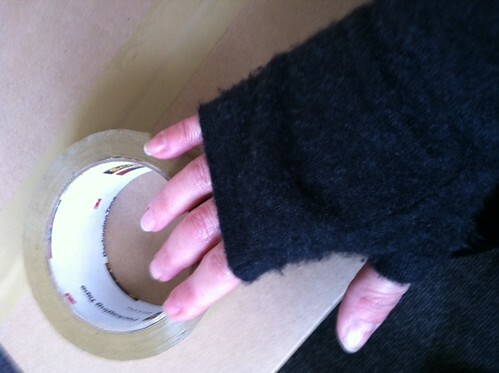 Pack boxes with wrist warmers/fingerless glove things. Just sayin. Finally, spotted down the hall, the bulletin board from The Usual Suspects! Ugly sweater parties are ALL THE RAGE. And yes, yarn fuzz + tape = cursing. Little kids singing Christmas songs is the best.